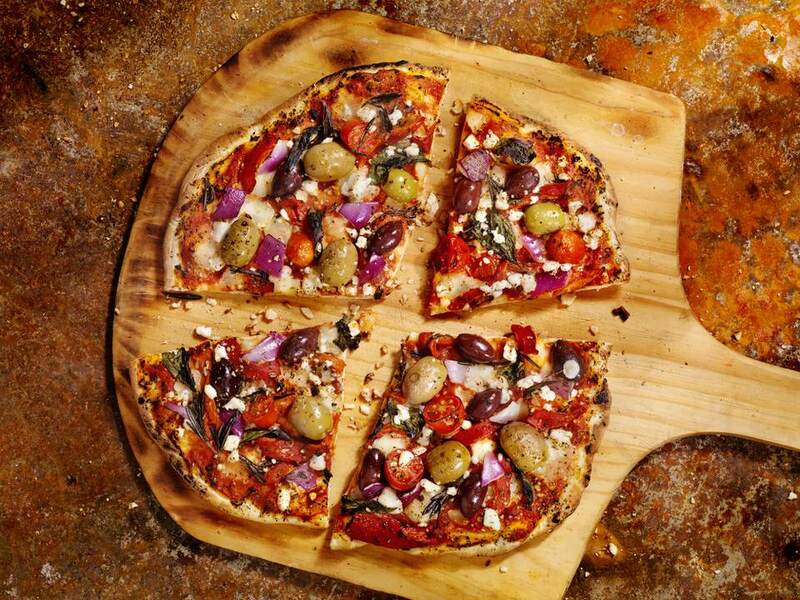 If you love thin crust pizza, this recipe for flatbread pizza with sundried tomatoes, olives and goat cheese is for you. This flatbread pizza is made with lavash, a type of flatbread that's relatively easy to find in grocery stores. It's usually sold in packages that contain a dozen or so rectangular flatbread pieces. This recipe is for two flatbreads. If you are using store bought flatbread, brush the flatbread with olive oil and place on cookie sheets. Bake for five minutes, so it gets a little crispy. Remove from the oven and evenly cover with the sundried tomatoes, olives and dollops of the goat cheese. Bake for 5 minutes more, or until the flatbread is crisp around the edges and the cheese is warm and soft. If you are making your own flatbread, follow the flatbread recipe to make the dough then lightly oil two rimless baking sheets. Set one ball of dough on top of each baking sheet and roll the dough out as thin as possible (put a towel under the baking sheet to keep it from sliding while you roll the dough). The thinner the dough, the crispier the crust will be. Brush a tablespoon of olive oil on each piece of dough. Bake the dough for 15 minutes until it is fairly crispy and lightly browned. Remove from the oven and spread sundried tomatoes,olives and dollops of the goat cheese on top. Bake for another 10 minutes or so, until the crust is brown and crispy and the cheese is soft.